I’m here to confirm those rumors. When I was in high school, I ran into a daily decision of epic proportions: What to wear. Perhaps you had the same decision to make (unless you grew up in a nudist colony or went to a private school). However, I had a very hard time remembering what I had worn on previous days. I simply don’t have that capacity in my memory. I would try to remember so that I wouldn’t wear the same outfit over and over again, but unless the item of clothing in question was in the laundry basket, I had no idea what I had recently worn. I needed a system for recording outfits so that I could space them out. Hence the spreadsheet. I wish I could show you the spreadsheet, because it was a thing of beauty. The tracking was fairly simple–dates ran horizontally while shirts and pants were in rows–but it was what I named my shirts that I wish I could share. Every shirt had a name. I don’t think I even had that many shirts, but almost all of them shared a color with another shirt, so I had to distinguish them from one another. That system worked for years. I can’t remember exactly when I ditched it–maybe when I went to college–but my current system works without a spreadsheet. Shirts I haven’t worn in a while are on the left side of the rack, and after a I wear a shirt, I hang it on the right side of the rack, so they’re constantly filtering through the system chronologically. It works well. But I still can’t tell you what I wore 2 days ago. What’s your system for not wearing the same outfit every day by accident? This entry was posted on Thursday, November 24th, 2011 at 9:56 pm	and is filed under confessions and tagged with confessions. You can follow any responses to this entry through the RSS 2.0 feed. Gabby and John–You two must be among the elite group of people (Steve Jobs, Neil Gaiman, Superman) who wear the same outfit every day. Hmmm… I do feel the need for a system other than “it’s clean”. I’m pondering the thought of a spreadsheet and it sounds amazing, especially naming the shirts. Your new system is good, however, it messes with my ROYGBIV organization in my closet. Living in an industrial modern loft I have a completely open closet (I use “closet” in a loose term). I have a rack on one wall of my room with no doors, completely visible to anyone who steps inside the room. So disorganization of the ROYGBIV that has been in place for years is not an option. My section of Black, white, and grey do seem to takeover, so I only allow myself to wear black pants and black shirts twice in one week and not in a row (and of course not together). When it comes to specifics my memory is sharp. I know what I was wearing all three times I went to the members only restaurant (blood and sand, I highly recommend, new at 15th and St Charles downtown) near my place… as a matter of fact I was embarrassed that the 2nd and 3rd time I wore a black shirt,(different shirts) jacket, and jeans (same jeans and jacket) with different shoes and fashion scarves. 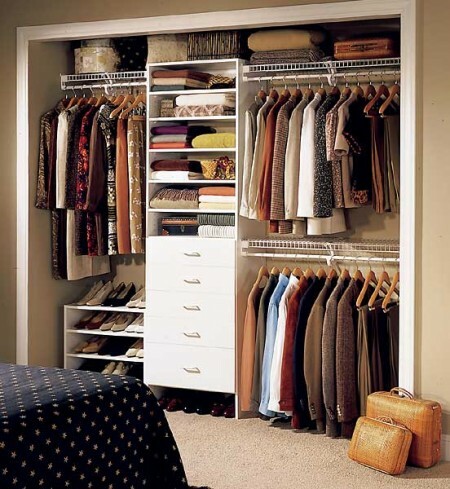 If I didn’t do a spreadsheet, how could I keep track without disrupting my closet organization?? Jodie–I think you need to try the spreadsheet system. Although, if you have a good memory for outfits, it may be unnecessary. You’re not supposed to wear the same clothes day after day? Um….. does it really matter if you wear the same thing more than once during a week? I’m wearing the same pants I wore yesterday. Yes, I’m at work and I was at work yesterday and no, I did not wash them. I constantly wear the same things to work all the time. I only have 3 pairs of dress pants that are in the work-clothes rotation and sine I work 4 days out of the week, I inevitably end up wearing one pair more than once. And shirts… I don’t keep track of what I wear when and don’t really care if anyone else notices if I wear something more than once. I don’t get it? Pants are different. I’m talking about overall outfits, the key component of which is the shirt (I think most people have far fewer pants than shirts). Ha. I had a professor in college that must have had a day of the week system. On Monday – she wore ‘x’, on Tuesday she wore ‘y’, on Wednesday she wore ‘z’ — and so forth. Well, since she taught Tuesday and Thursday classes – we got to see the same outfits every week. Her lectures was just as mundane as her clothing rotation. So whatever ‘rotation’ someone has with their clothing – I would appreciate not being able to identify the day of week by the clothes you wear. Ah, the day-of-the-week rotation. I thought about that, as it certainly simplifies things, but as you found, it becomes all too predictable. What about a rotation more than 7 and less than 14 outfits? A rotating rotation if you will. Outfit 3 always follows outfit 2, but they are not on the same days of every the week? You could do that, but I think the best way to leverage a limited wardrobe is to mix things up as much as possible. Even now I don’t stick to a strict rotation–I’ll choose from the first 3 to 4 shirts on the left of my rack on any given day. AAAHAHAHA. I can just see you dilligently updating your spreadsheet! My system is that my work clothes go straight to the laundry room as soon as I take them off. We take forever to do laundry, so there’s really no risk of wearing things too often. So you wash your clothes after a single wear? Because I wear undershirts, I wear my outer (visible) shirts a number of times before washing them. My system is to just throw my work clothes into the laundry every day. But, I do like the ROYGBIV system for my closet organization, as Jodie mentioned above. I have several tops in the different colors of ROYGBIV and I usually remember which top of a particular color I’ve worn last, so I just move through the rainbow each week. Neutrals are placed at the end of my ROYGBIV, so I throw in a few of those tops every couple of days, as well. Speaking of fashion, one popular style that I like is the “flyaway” cardigan – the kind that is open in the front. You can own a single black cardigan, single brown cardigan, etc. and wear several different tops underneath, creating a whole new look every time! I wear a lot of my sleeveless, frilly summertime tops under these cardigans in the fall, winter, and spring – so it allows me to mix-and-match, create new outfits, AND save money because the tops are doing double-duty throughout all of the seasons! Very clever, Colleen. I think guys do that with ties and sport jackets. They add a ton of permutations to your wardrobe!